Congressman Cicilline went on MSNBC to discuss the American response to Russia’s interference in the presidential election. Congressman Cicilline spoke on the House floor regarding the impact that Republican efforts to privatize Medicare will have on seniors like Middletown resident Trudy Willis. 169 members of the U.S. House, led by Congressman David N. Cicilline (D-RI), today sent a letter asking President-elect Donald Trump to rescind alt-right leader Steve Bannon’s appointment as White House Chief Strategist. 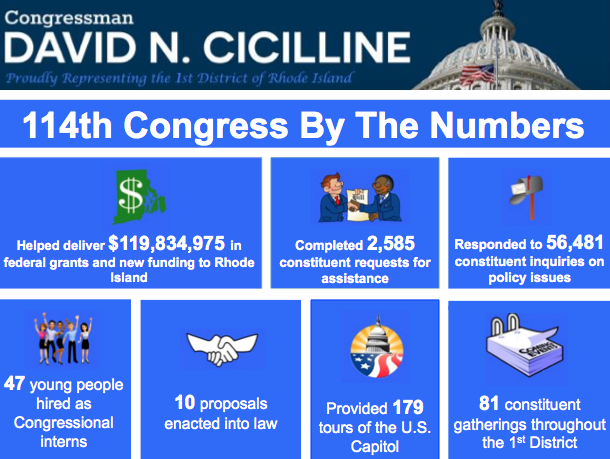 Congressman Cicilline announced that he has reintroduced The Presidential Tax Disclosure Act (H.R. 540) to require the publication of current tax returns filed annually with the Internal Revenue Service by any sitting President of the United States. Congressman Cicilline issued the following statement after House Republicans voted to move forward on repealing the Affordable Care Act. "The American people should always have confidence that their elected officials are acting only in the public interest. This is especially true for the President of the United States and his appointees." Find out what's happening now on the House floor.